From stress-free application to an enduring, easy clean finish, this premium quality interior paint was designed to deliver Exceptional Performance In 1 Coat at an outstanding value every day. CIL EPIC has outstanding washability, scrubbability and stain resistance providing a durable long lasting paint. With over 400 one coat colours to choose from in our CIL EPIC palette you'll find the colours you love with ease. CIL Duo Premium Paint + Primer in One makes it easier to achieve a high quality finish with fewer steps. The Duo paint formula combines whats most important in a primer, enhanced hide and adhesion, with a premium quality paint for a durable finish in less time. CIL DUO Paint + Primer in One makes it easier to achieve a high quality finish with fewer steps. The DUO paint formula combines what's most important in a primer, enhanced hide and adhesion, with a premium quality paint for a durable finish in less time. CIL DUO Tintable Tester is a tester size of CIL DUO Eggshell paint that provides an easy and cost effective way to experiment with different colours at home. EPIC Interior Latex Eggshell Accent 3.37L-82306 From stress-free application to an enduring, easy clean finish, this premium quality interior paint was designed to deliver Exceptional Performance In 1 Coat at an outstanding value every day. CIL EPIC has outstanding washability, scrubbability and stain resistance providing a durable long lasting paint. With over 400 one coat colours to choose from in our CIL EPIC palette you'll find the colours you love with ease. EPIC Interior Latex Eggshell Accent 3.37L-82306 is rated 3.7 out of 5 by 6. Rated 5 out of 5 by jugs from Does Everything it Says it Does Usually bought Behr but decided to try this one out. Outstanding! Did everything it claims it does. One coat, great coverage, low odor, etc. Highly recommend and will definitely be using again. Rated 1 out of 5 by jason from New paint is not one coat rip off for price point. I normally use valspar and Behr paints in this price point decided to use this as a coat solution.Using it paint over a two coat white painted wall in a base 82306.Worse paint for thickness coating and needs duplicate coats at a high price point. Rated 2 out of 5 by LKRK from Had trouble with this I bought this paint as they were changing from the CIL Duo I had used previously. They had no more Duo which had worked really well for me and was about $20 cheaper per 3.31L. 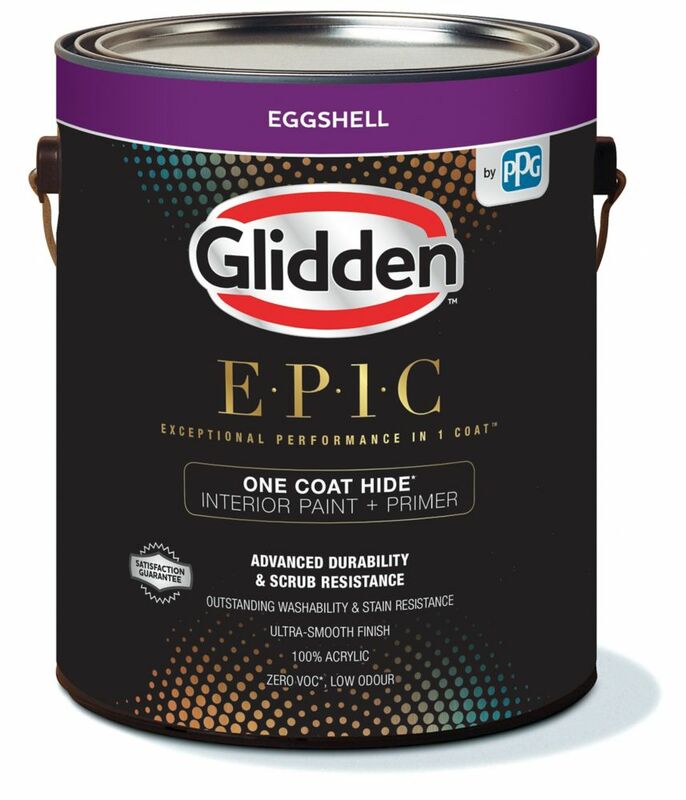 As I was continuing painting the whole house, I wanted to stick with one brand so bought the EPIC. I ended up having to do 3 coats whereas the previous Duo had required only 2 coats, and the finish in spots is blotchy and odd. Same house, same walls, same tools - granted, a different room but very different results. Will find another brand next time for the price. Rated 5 out of 5 by Brent from Used In Kids Room My wife and I used this in our daughters room, we repaint the 1 wall once a month as she likes to paint murals on it. This will be my new regular as it covers everything so well. Rated 4 out of 5 by Eveit from Incredible I bought this paint a few weeks ago for my master bedroom. The colour is beautiful and my husband and I both agreed that the coverage was fantastic. Really pleased. Rated 5 out of 5 by Bgribb from AMAZING! Really happy with the coverage in this paint. Chose one of the colours from the brochures and really liked the application.